Dr. Crystal Mitchem has been a small animal veterinarian in Lincoln and surrounding counties for 18 years. She graduated from North Carolina State University College of Veterinary Medicine in 1999. 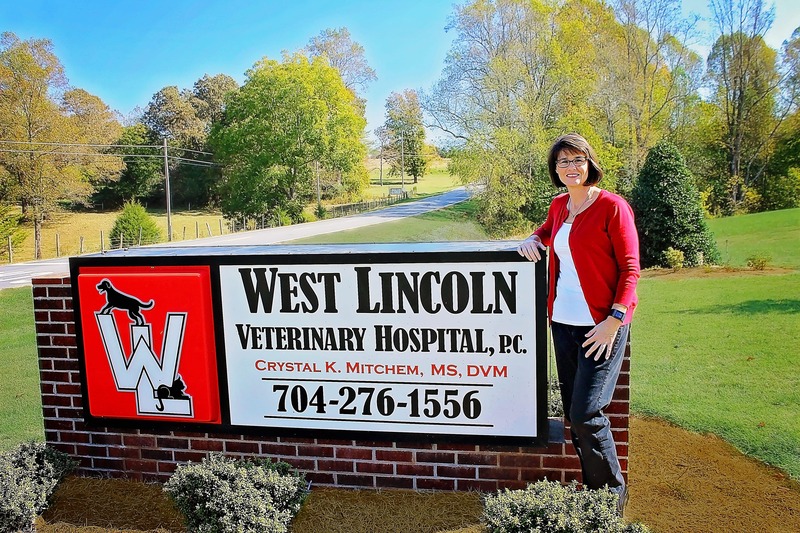 Before veterinary school, she received a BS in Animal Science from North Carolina State University in 1993 and a MS in Animal Science specializing in reproductive physiology from the University of Missouri in Columbia in 1995. Originally from Lucama, a small farming community in Wilson County, NC, Dr. Mitchem grew up on a tobacco and beef cattle farm. Her love of animals started early with involvement in the 4-H livestock project. Much of her youth was spent showing registered Polled Hereford Cattle. She also raised every 4 legged furry creature she could catch. After living in the North Brook Community of Lincoln County for the past 18 years she now considers Lincoln County home. She is married to Wayne Mitchem who works for North Carolina State University and raises blackberries, grapes, soybeans and hay on the family farm with his bother. She and Wayne have two girls, Regan and Jordan. Their furry family members include 3 cats (RC, Pallet and Cheddar) and mixed breed rescued dog, Daisy. She and her family also have a barn full of spoiled rotten beef show heifers and a herd of pet Hereford and Commercial Cattle. When not at work, Dr. Mitchem can be found with her girls at the cattle barn with their cattle. Dr. Mitchem also loves to garden. She planted and tends to all the beautiful landscaping around West Lincoln Veterinary Hospital. Dr. Mitchem enjoys working with her 4 legged patients and their families. In her spare time she likes to garden, read, and do crafts.